Most of the reviews that I share with you involve curriculum or other products for the giggly girls. While Working it Out: Poetry Analysis with George Herbert is definitely a study that can involve the whole family or even high school students on their own, I have been using it for my own Bible study, reading, and devotional. Everyday Education, LLC has introduced me to a fantastic Christian poet that I didn’t even know existed. It has been lovely. Working It Out is a poetry study written by Joseph Womack that focuses on the poetry of George Herbert. Herbert was a 17th century poet. He is a favorite poet of many well-known authors including C.S. Lewis. Coming from what was considered a distinguished family, being a scholar at Cambridge and a member of the English Parliament, and finally a priest in the Anglican Church, Herbert spent much time in poetry pondering and “working out” his salvation. He dealt with spiritual conflicts, many which waged in his own soul, according to his own writings. This is likely where Joseph Womack took the title of this poetry analysis course from. The poetry of Herbert has been a very interesting read, though not easy in the least. I spent much time reading and rereading each poem before I even began to dig into the meanings and movement of thought within each one. Working It Out brings together many of Herbert’s poetry with the direction in analysis from Joseph Womack. Womack works through each of the poems in the same way. After the analysis of the poem, there are two more sections that are a bit more focused on the devotional aspect of the poetry. The Poem sections is just that – the poem. The Big Picture is a short overview of what the poem is about. The Parts of the Picture is a stanza-by-stanza breakdown of what the poem is discussing, including the literary elements, devices, and techniques used. This is also where the parts that I seem to be most confused about are discussed and defined. The Parts of the Picture Come Together takes the breakdown and puts it back together, producing a more meaningful understanding of the movement of thought through the poem. Reflection Questions and Scriptures for Further Reflection often brought a very deep and meaningful conclusion to the poem for me. More than once, this is where I had that “a-ha” moment of understanding. More than once, I had to immediately stop and email someone because that poem coupled with those scriptures felt like just what God was wanting me or someone who was hurting to hear right then. I have been working through approximately 2 poems per week, spending about 30 minutes per session on the poems. I say approximately 2 poems per week because some poems don’t require as much thought from me and others have required quite a bit more. If you work through this as a course and as suggested, there is plenty of material to cover a year’s worth of time. There are 51 poems in this book and it is suggested to work through one per week. In the introduction, Janice Campbell (Everyday Education, LLC) gives a number of suggestions to make the study even more meaningful. I have taken these suggestions to heart and have definitely gotten more out of the poems that I have written out long-hand or read aloud. Working It Out is available as either a printed book or in digital format as a PDF. It is over 200 pages and features 51 poems with analysis. You can find a sample of this poetry study at Everyday Education. This has been a terrific blessing to me. And to Miss L. She may be 10 but she loves to read and write poetry. We have shared some of the poems in Working It Out and talked about their beauty and meaning. She did not delve into the analysis with me but more than once, she enjoyed reading some of the poetry and understood innately the beauty of Herbert’s words. Be sure to read additional reviews of Working It Out, as well as Perfect Reading, Beautiful Handwriting and Excellence in Literature Handbook for Writers from Everyday Education, by the Homeschool Review Crew. Not sure what to really expect from Linguistic Development through Poetry Memorization or my girls’ responses to memorizing poetry, this one was a gamble to begin. It has been a gamble that has really paid off! All three girls are really enjoying this program from Institute for Excellence in Writing (IEW) and I am seeing a tremendous amount of growth in their language and confidence. It seems everywhere we go, the girls are enjoying sharing these poems that they are memorizing with just about anyone who will listen. With such an easy to implement program that provides so much growth, I can only say I wish I knew about this earlier. I should have suspected they would love it the minute it arrived at the house. The girls grabbed the book and took turns flipping through it to read poems out loud that caught their attention. I think they spent about an hour taking turns sharing poems from the book. We received the set for Linguistic Development through Poetry Memorization that included the teacher’s manual and a set of 5 CDs, one for each of the levels of poetry learning. Also included in the set with the teacher’s manual is a bonus DVD of a presentation titled “Nurturing Competent Communicators.” As a reviewer, I also received a printed version of the Student Book. The printed student book is sold separately from the set with the teacher’s manual and CDs. The Poetry Memorization program is simply that – poetry memorization. Well, add in some speeches and other important excerpts for the later levels, but much of it is poetry. The program is based on much research and observation that poetry gives us examples of sophisticated language patterns and rhythms. By encouraging the memorization of these language patterns, we are increasing our student’s vocabulary and placing these sophisticated patterns in the mind. This is stretching the student’s mind and allowing for growth to occur. Bluntly put, this stretching of the mind by memorization makes the student smarter. Poetry Memorization is a series of poems with five levels. The first four levels are all poetry. The fifth level is excerpts from speeches, including Elizabeth I, Abraham Lincoln, and Winston Churchill, and lines from some important written works such as the Declaration of Independence and the Preamble to the Constitution. The first level is mostly fun, exciting, or silly poems. There are some that are just a few lines; others are several stanzas. The girls have loved doing these poems. Poems such as “Ooey Gooey” and “Celery” have brought fun to it while poems such as “The Vulture” and “The Yak” have actually brought discussions about the animals, times in the past, and finding places on maps. The girls are currently working on poems 9 (Miss J) and 10 (Miss E and Miss L). An important aspect of the memorization of poetry is to maintain those poems or excerpts once you move on to the next one. This practice is an important part of the program and I love that there are tracking pages to help you not only know where you are working now but what you need to practice so you don’t forget it. At the beginning, where we are, we practice all previous pieces each time. As you get into levels 2 and up, there is a schedule to help you continue to practice without having to take the time to review every single piece every single day. This has been fun for us because it is a part of our schoolwork that we can do anywhere we might happen to be. We can do it in the car while driving to dance or the library. We can do it outside while enjoying a walk or just sitting. We can recite poetry while working on dinner or folding laundry. It was an easy program to add to our day because it doesn’t have to be more time sitting at a table or with a book in front of us. Having the CDs of the poems allows for the teacher to actually have a bit of time where someone else can direct the repetition, if needed. If you would like to see a video of Miss J and Miss L reciting pieces, please visit our YouTube channel. Miss J is reciting After the Party. Miss L is reciting My Shadow. I can only say “OH MY!” These resources have stretched me farther than I ever imagined in learning about how children learn. Mr. Pudewa has an amazing ability to reach the teacher with information stated in a way that makes sense and is full of insight that I wish I had known a long time ago. You cannot judge comprehension by attentiveness. You can’t get something out of a child’s brain that isn’t in there to begin with. Reliably correct and sophisticated language patterns are required for a student to be successful. Listening and speaking predicate reading and writing. Listening and speaking are harder to evaluate and assess while reading and writing are easier to assess. Hearing happens whether you like it or not; listening has the connotation of an active and intentional choice. I have also made it all the way through On Listening and On Speaking. There is some really good overlap (read that: necessary and needed repetition of the information shared) between these two and I imagine that repetition will continue in the next two of the series: On Reading and On Writing. I found myself wishing I’d had access to these resources years ago, while I was teaching in the public schools. These MP3s give several hours worth of listening and learning so I still have quite a ways to go. I definitely plan to continue listening to these and will rewatch the DVD, as well. IEW has given us such a treat by sharing these audio files and the DVD with us. This has convinced me that we need to included poetry memorization, for both their minds and their confidence. I will be doing a lot more memorization with the girls, especially since I see them thriving with it. We have also had the pleasure of reviewing IEW’s Phonetic Zoo. Read that review here. Read more reviews from the Review Crew by clicking on the banner. 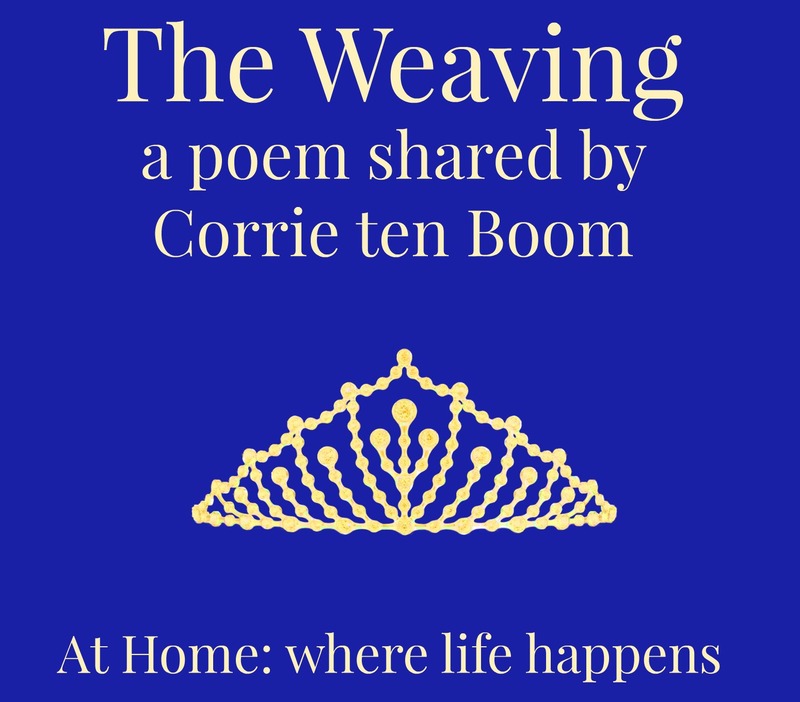 The Weaving, as popularized by Corrie ten Boom. I first heard this lovely poem in a documentary about Corrie’s life. I don’t know if she wrote it or just shared it often. Most of what I have found claim she is the author but there is indication that she just shared it but didn’t know who wrote it. She would show folks the underside of a weaving, which was messy with all sorts of knots and crossed threads. You could not tell what it was or even see a hint of the true beauty of the piece. But when she turned it over, there was a lovely crown, beautifully woven out of all those messy threads from the underside. We often only see the underside but God is the master weaver and will make something beautiful out of our lives if we allow him to. Get more ideas from the Homeschool Review Crew in the 2nd edition of the Homeschool Collection. As Veteran’s Day approaches, I thought I would share a few ideas that we incorporated last year. I found this poem in a little printable and printed off a copy for each of the girls. They read it and then we talked about each stanza of the poem. 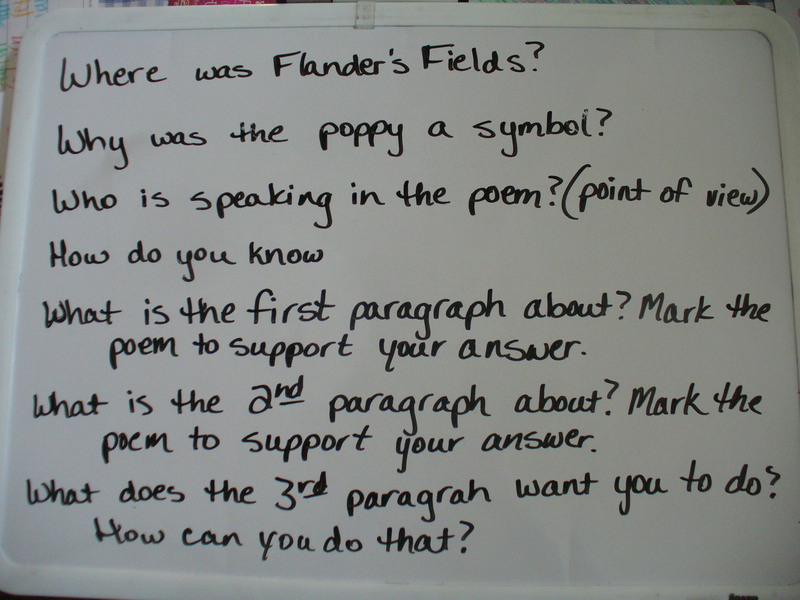 After that, I had them answer these questions and mark their poems. We also pulled out a map and found the location of Flander’s Fields. 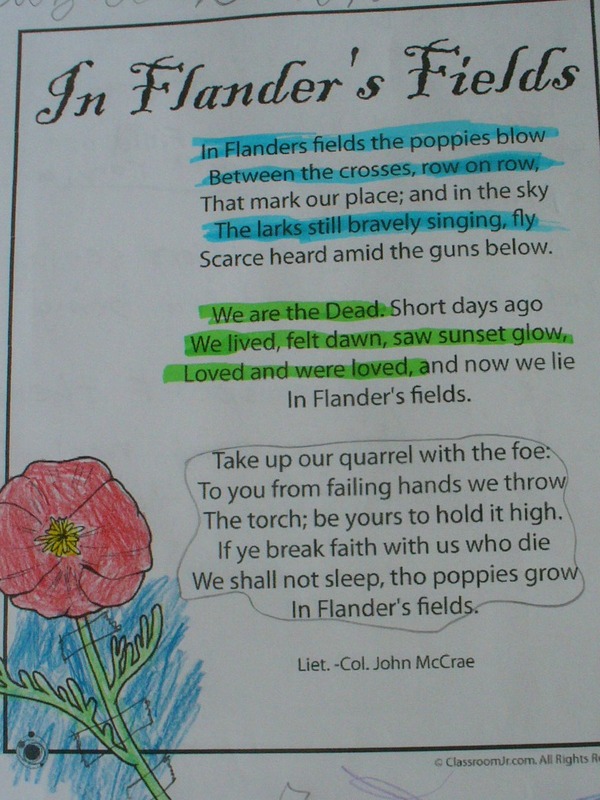 Flanders Fields Music is a very nice website. 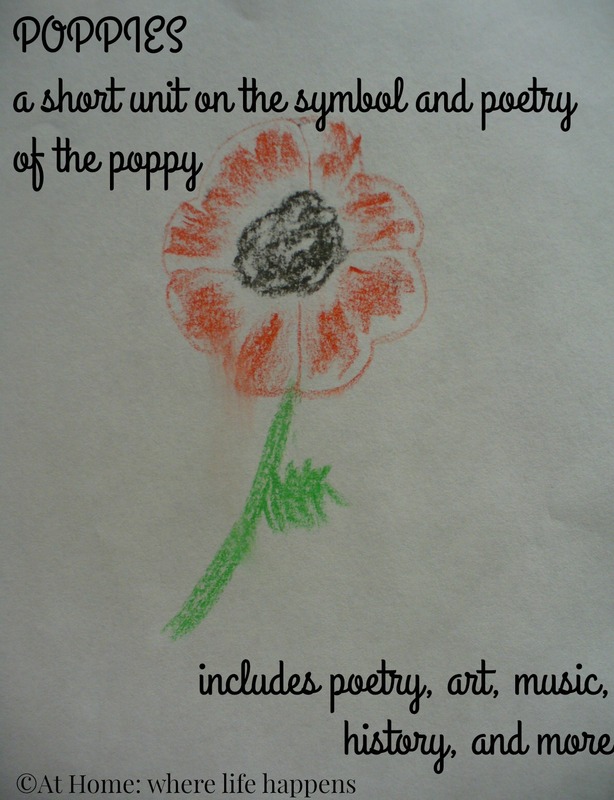 It contains a whole set of lessons for the poem, a song, a video, lots of authentic pictures, and more. Last year commemorated 100 years since the beginning of WWI. England spent a great portion of the year installing a memorial at the Tower of London titled “Blood Swept Lands and Seas of Red”. We saw a link about it early on in the installation and watched it grow through checking back at that link. It is quite an amazing installation with 888,246 red ceramic poppies, one for each British or Colonial serviceman killed in the War. There are probably some other links for images of the memorial but here is a link to the Tower of London and to Wikipedia. The Tower of London has some interesting videos, as well. The girls were asked to create a piece of artwork to illustrate something we discussed or an emotion they felt. These are what they created. 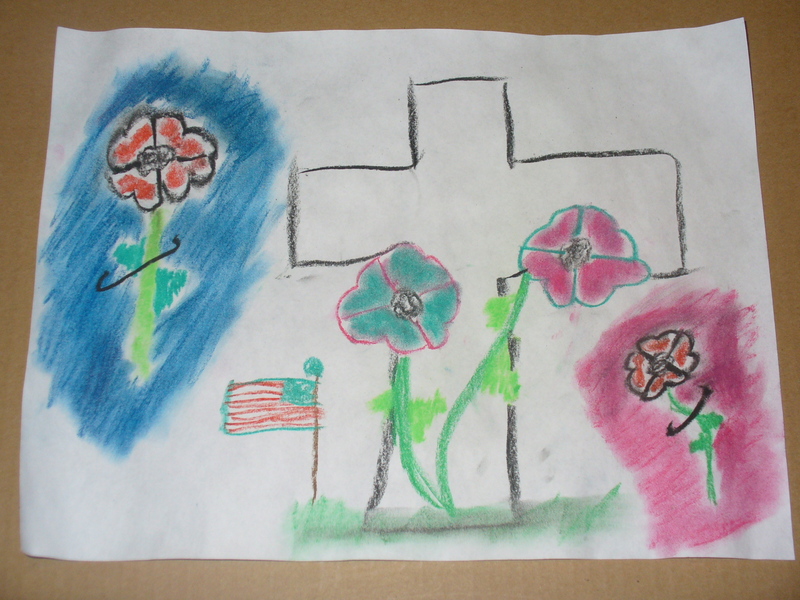 Using the letters for the word POPPIES, the girls wrote about things they learned or that touched them in this study. Here are their acrostic puzzles. Here is a copy of the acrostic poem that you can print or save to use with your students. 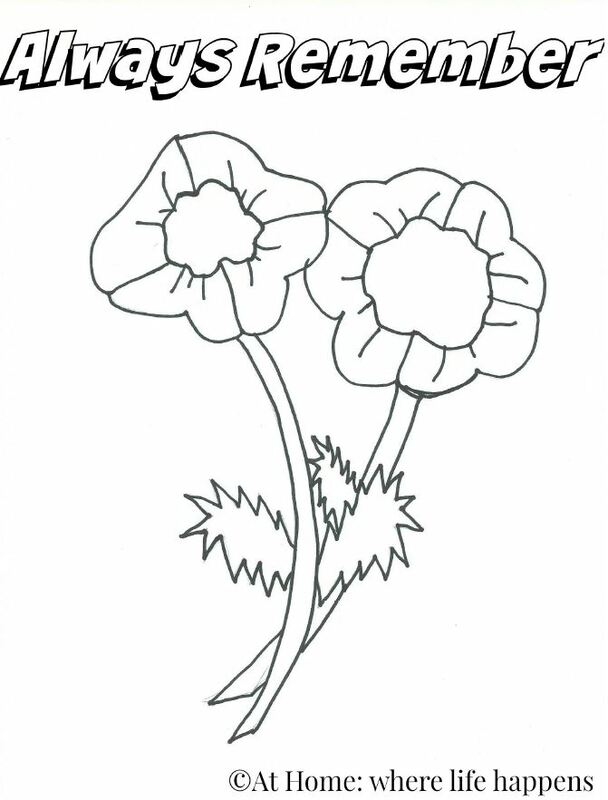 Here, also, is a coloring page that I created for you to print or save for use with your students. We also talked with the girls’ grandmother about her childhood. When she was a child, she sold poppies as a fundraiser to help an organization her family was a part of. It was fun for the girls to hear that Oral History and learn a bit more about their family. If you have someone your students can talk with, you might find out something interesting like this, as well. 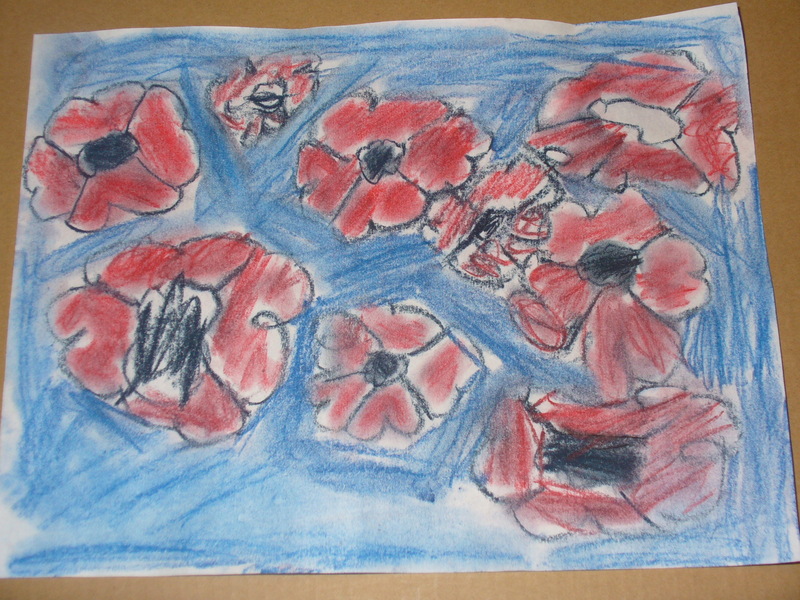 It is definitely worth discussing what they remember about the times of war they experienced. There is much to be learned, including an appreciation for what we have. 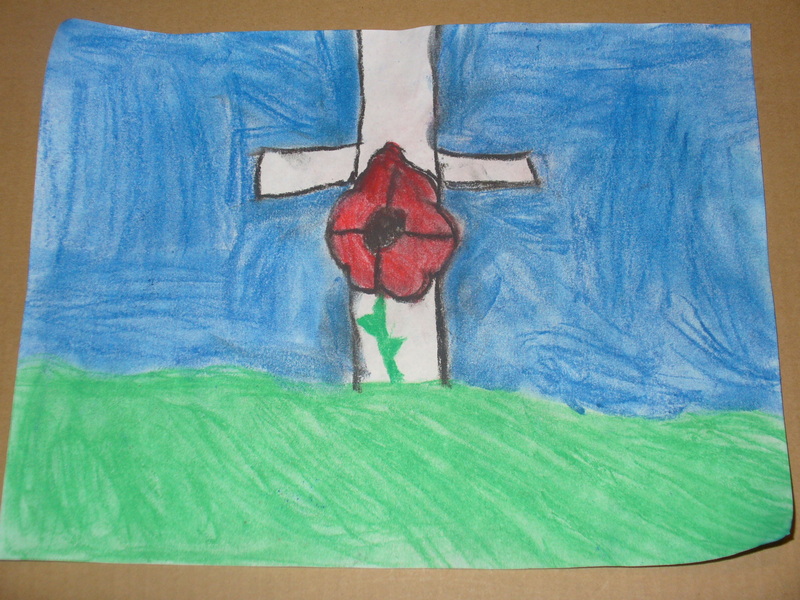 I hope you enjoy your poppy study and remembrance of those who have died protecting our freedoms. The theme for this month’s Poppins Book Nook is poetry. We love poetry and experience it in a variety of ways all the time. One of the giggly girls enjoys pulling poetry books off the shelf and reading them just because. She also enjoys writing poetry and her gifts always include a poem written just for you. I never really enjoyed poetry all that much but maybe that is because I don’t know how much poetry I experienced until I was in junior high and high school and having to read the “classical” style poetry. (That being said – I remember really liking Beowulf.) I don’t think that exposure at that level is bad but if you have had a good experience with it a number of times before that, I think you’ll enjoy it a whole lot more. 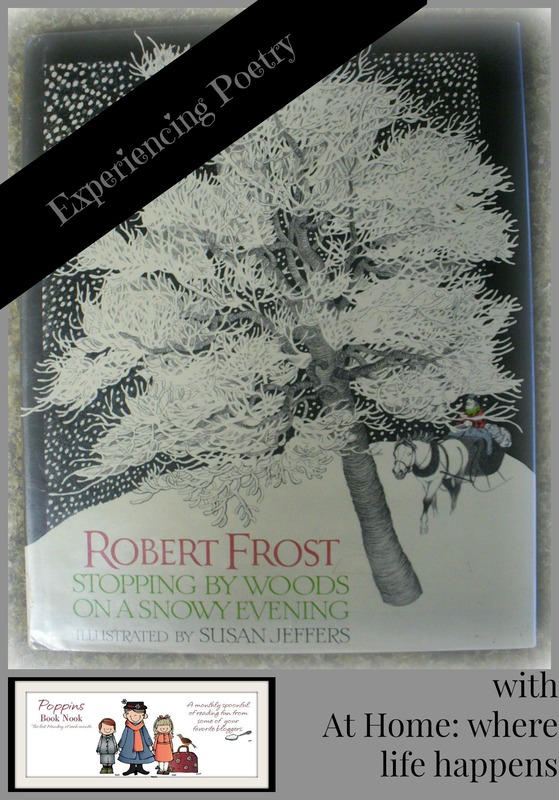 Our PBN selection just happened to line up perfectly with our Five In A Row selection: Stopping By Woods On A Snowy Evening by Robert Frost with illustrations by Susan Jeffers. This lovely poem and accompanying illustrations opened up a whole lot of learning for the giggly girls. 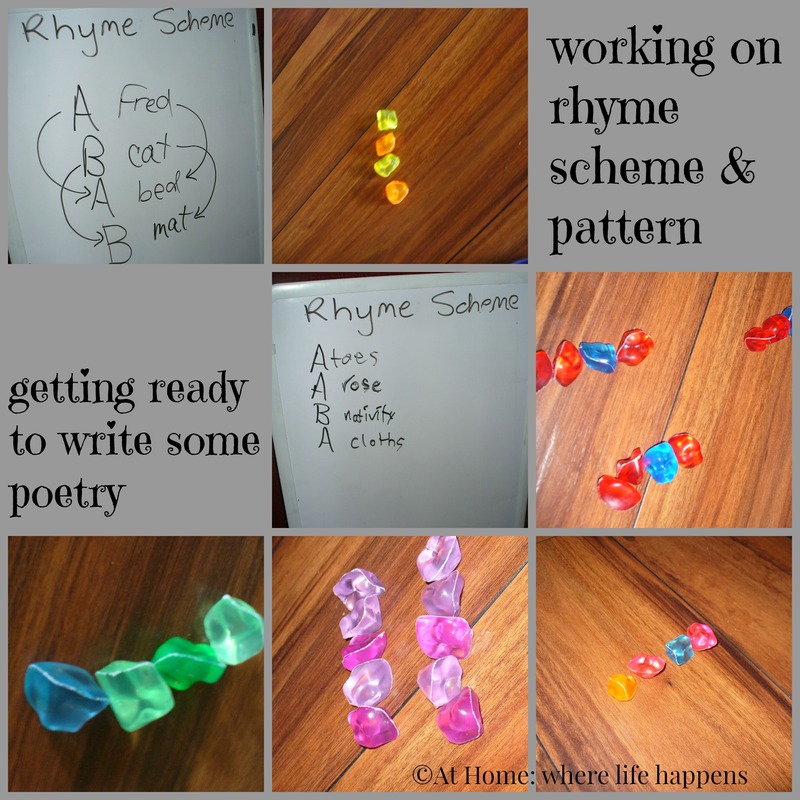 One of the activities that we did in our FIAR study was to learn about poetry, rhyme, rhyme scheme, and more. We used a lovely set of posters that we have that give us examples of many different styles of poetry. We looked at them and read the example of the poem. Then we talked about what it was like: number of lines, rhyme, rhyme scheme, subject, fact or fiction, and whatever else the girls could notice about the poem. Then we read through some of the information about that poetry style. This is something we do a few times a year and it helps the girls’ awareness of the use of poetry that they come across in the bigger world. We read through Stopping By Woods a number of times and the girls read it on their own, as well. J’s reading is coming along nicely and she was able to read a good bit of the poem without help. 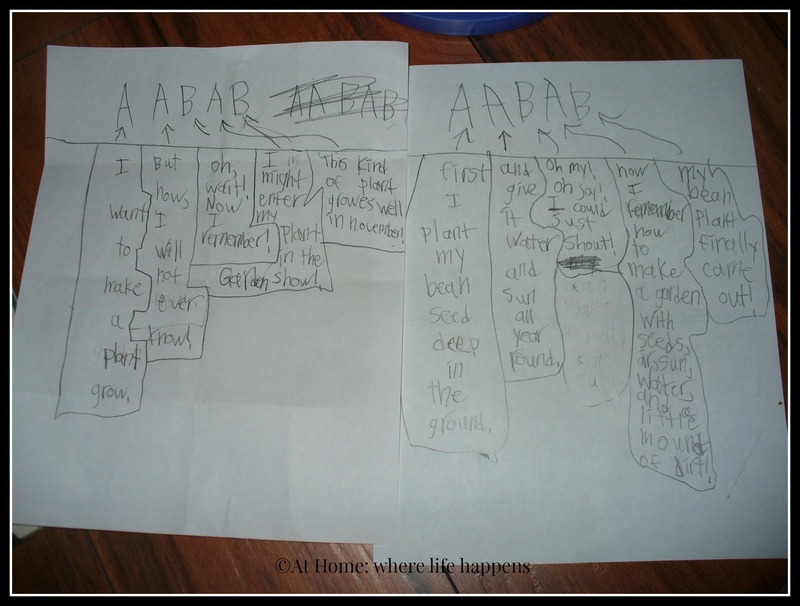 A good activity to do with a poem like this is to look closely at the rhyme scheme. It is actually a very interesting rhyme scheme. It is AABA in each stanza. The next stanza takes its A rhyme from the B of the previous stanza. It ties the poem together really nicely. We looked closely at that and the girls recreated it with counting crystals. After that, the girls created their own rhyme scheme and wrote a poem to fit their rhyme scheme. This was a fun day in our studies. 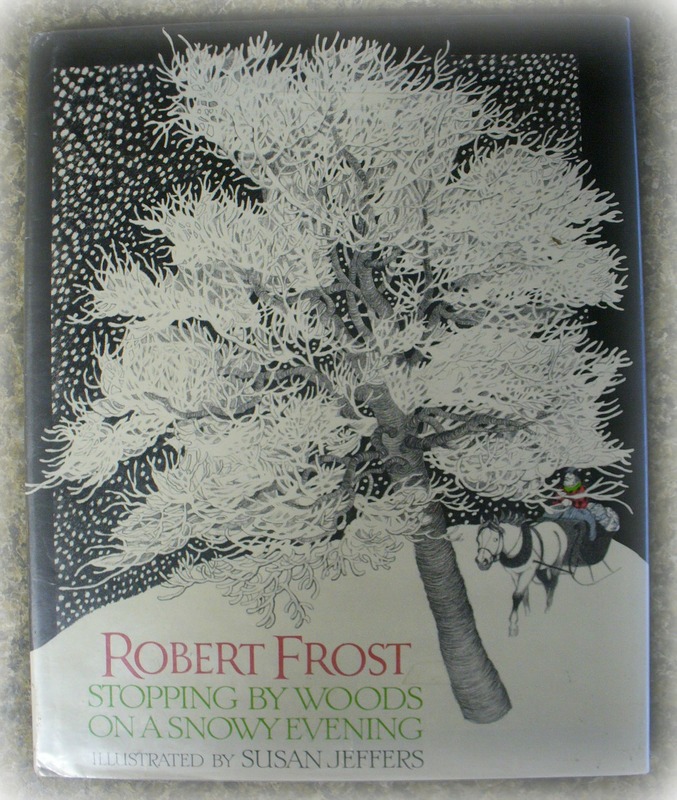 If you are looking for further activities to do with Stopping By Woods On A Snowy Evening, check out our FIAR post about this book. There was so much to do with it! And, as a final note, this will be our last post a co-hosts of the Poppins Book Nook. It has been a fun year but with all the changes that we naturally go through in a year, being a co-host of PBN is just not right for us for the next cycle of the PBN. It has been a fun year and the themes mixed things up for us some. 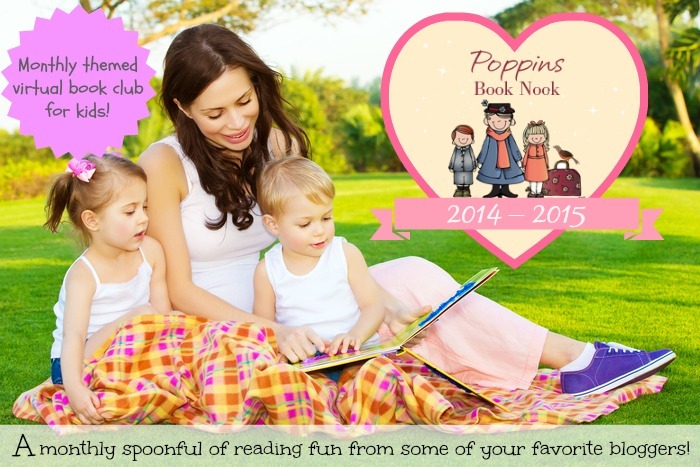 Thanks Poppins Book Nook! If you want additional ideas for this month’s theme, please visit Enchanted Homeschooling Mom and the other co-hosts of Poppins Book Nook.